Red Wheel ∕ Weiser Online Bookstore | Breakthrough! : Inspirational Strategies for an Audaciously Authentic Life by Janet Bray Attwood, Marci Shimoff, Chris Attwood et al. You can live the life of your dreams, and Breakthrough! Inspirational Strategies for an Audaciously Authentic Life will show you how. Learn the secret that New York Times bestselling authors Janet Bray Attwood, Marci Shimoff, Chris Attwood, and 18 other experts know: you can consciously create the life you�ve always wanted. Here you will find 22 strategies using wit, deep-insight, and heart-centered wisdom to empower you with the knowledge and motivation to create a life of abundance, happiness, health, and love. 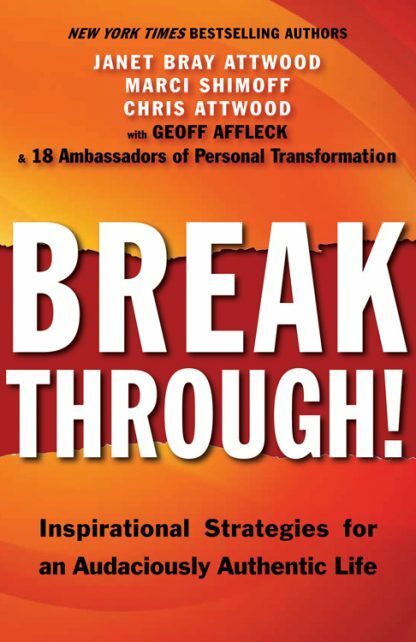 Covering topics from career to relationships to personal transformation, this international dream team of authors will show you how to finally breakthrough and live the life you were born to live. No matter what your circumstances, there is a way to make a change, and this book will be your guide. You will find the inspiration and tools to create a life that is audaciously authentic in every way. Janet Bray Attwood is a visionary, a transformational leader, and a world humanitarian. Janet is coauthor of the New York Times bestseller The Passion Test: The Effortless Path to Discovering Your Life Purpose. She and her business partner, Chris Attwood, have trained more than one thousand Passion Test Facilitators in forty-five countries.She is a founding member of both the Transformational Leadership Council and the Experts Industry Association. Marci Shimoff, is the coauthor of six of the Chicken Soup for the Soul books, including Chicken Soup for the Mother�s Soul, and was a featured teacher in the movie and book, The Secret. Marci is a highly successful speaker who travels to women�s associations, universities, and nonprofit organizations worldwide to teach her formulas for success and personal fulfillment. Chris Attwood is coauthor of the New York Times bestseller The Passion Test: The Effortless Path to Discovering Your Life Purpose. He is a founding member of the Experts Industry Association and the Transformational Leadership Council, which includes more than one hundred of the top speakers, trainers, and authors in the world. He is an expert in the field of human consciousness and is also deeply grounded in the practical world of business. Geoff Affleck is a marketing expert, speaker, trainer, and author. He has spoken on how to discover and monetize your passions, sharing the stage with transformational leaders including Janet Bray Attwood, Chris Attwood, Marci Shimoff, T. Harv Eker, and John Assaraf. As a cofacilitator in the �Enlightened Bestseller Mastermind Experience,� Geoff helps aspiring authors develop their online marketing platforms.